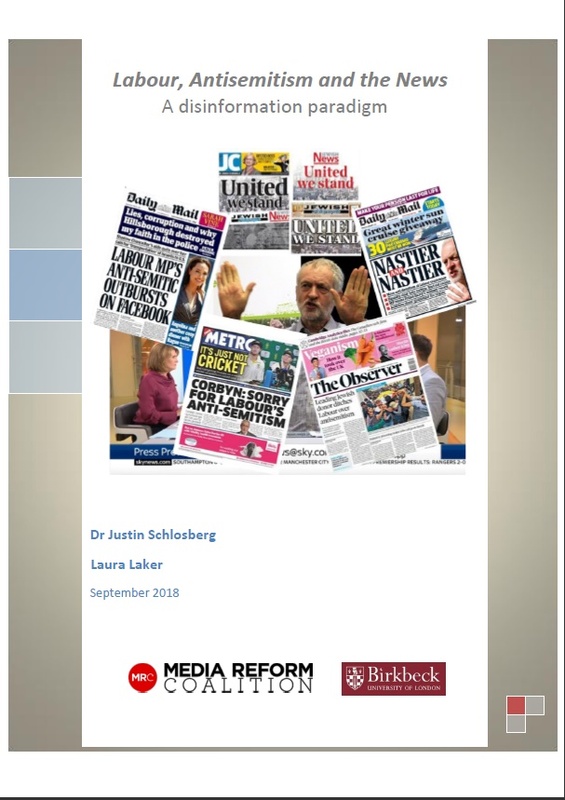 A new report from the Media Reform Coalition, based on research by Dr Justin Schlosberg from Birkbeck’s Department of Film, Media and Cultural Studies, has found significant inaccuracies or misleading coverage in news surrounding antisemitism in the Labour party. Two thirds of the TV news segments analysed contained reporting errors or substantive distortion. In an in-depth case study of 260 articles and news segments from the UK’s largest news providers (including the BBC, Guardian, Sky News, the Daily Telegraph, The Times and the Huffington Post), the research found 29 examples of false statements or claims, six of them on BBC TV news programmes. A further 66 clear-cut instances of misleading or distorted coverage were identified, including omission of essential facts or right of reply, and contentious claims repeated by journalists without verification or qualification. Dr Schlosberg also found “overwhelming” source imbalance, especially on television news, where voices critical of Labour’s revised code of conduct on antisemitism were regularly given an unchallenged and exclusive platform, outnumbering those defending Labour by nearly 4 to 1. The coverage routinely exaggerated the extent to which the International Holocaust Remembrance Association (IHRA) definition of antisemitism has been adopted, both around the world and within the UK. The researchers acknowledge that journalists should be allowed to make mistakes, and that the research findings do not mean that the failures were intentional or that journalists and news institutions are inherently biased. But they argue that professionals should strive for accuracy, establish essential facts in any given story, and actively seek out dissenting or contesting opinion including, in this case, within the minority group in question within other affected minorities and among relevant experts, both legal and academic. It is also journalists’ responsibility to offer a due right of reply to the accused and interrogate contentious claims made by sources on all sides, regardless of the complexity and sensitivity of the story. Dr Justin Schlosberg, Senior Lecturer in Journalism and Media at Birkbeck University, said: “The coverage of this issue has been grossly misreported in large swathes of the news – and especially the news that reaches the most people. Almost all the reporting failures privileged a particular recurrent narrative: that the Labour Party has been or is being lost to extremists, racists and the ‘hard left’. Some of the most aggressive exponents of this narrative were routinely treated by journalists – paradoxically – as victims of aggression by the party’s ‘high command’.